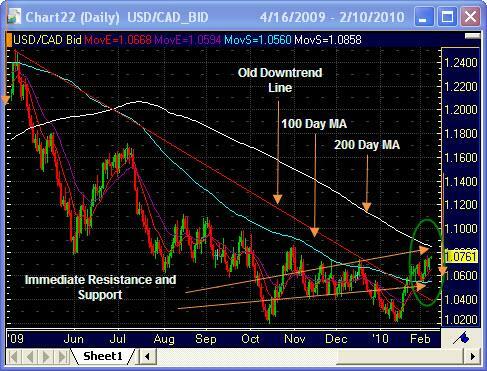 USD/CAD is trading right now around the 1.0750 level on the daily chart just between the 100 and 200 Day Moving Averages respectively. Look to these levels for immediate support and resistance on a daily basis and to give direction to the pair in the coming weeks. If you look at my earlier post you will notice that we examined this pair in January and were looking for a break of the 100 day moving average around 1.0550 (which it did) and also broke downtrend support, and the next resistance level was the 200 day moving average at 1.0858. Immediate support is now seen at the 100 day moving average around 1.0550 and down below to the old downtrend resistance line (now support) around 1.0450. A break to the topside could yield to1.1000, on to 1.1300 and upward to the 1.1600 area. Remember this is on a daily time-frame so you should always look at shorter time-frames as well depending on your strategy. This looks like a relatively quiet week both for USD and for CAD so keep your eye on Euro-zone news events to affect USD which will in turn affect the pair. Also, watch oil prices as there is a strong correlation to CAD and EUR as well.